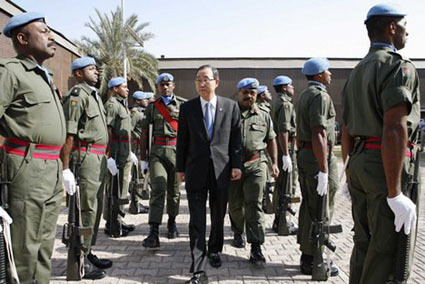 Fiji’s contribution to United Nations peacekeeping efforts has risen by almost 30 per cent in the past year alone, as the world body defies attempts by Australia and New Zealand to have Fijian troops excluded because of the 2006 coup. Figures obtained by the NZ investigative reporter, Selwyn Manning, for his intelligence company, 36th Parallel Assessments, show that Fiji’s UN contribution is at record levels. The number of military and police officers supplied to various operations increased by 29 per cent between April 2011 and May 2012 – more than the combined total provided by Australia, NZ and Canada. Here’s a link to Manning’s illuminating report on Pacific Scoop NZ, which also demonstrates how much the United Nations is in a cleft stick, trying to balance its need for more Fijian troops while trying to placate the demands of the Australian and NZ Governments. Fortunately for Fiji, its soldiers are in such demand because of their high calibre and willingness to put themselves in harm’s way that the UN has turned a deaf ear to the calls to reject them. Manning’s report won’t be welcomed in Canberra and Wellington. It’s a major diplomatic embarrassment and further proof – if any were needed – of the folly (and failure) of Australian and NZ attempts to isolate Fiji. “it is likely that Australia and New Zealand governments will publicly begin to soften their positions against the military regime, and will probably use the 2012 Pacific Islands Forum leaders’ summit as an opportunity to articulate an incremental re-engagement plan”. Manning makes the assumption that Fiji will want to rejoin the Forum should the Forum leaders decide to incrementally engage Fiji at the August meeting in Rarotonga. What if Fiji takes the same stance it has taken on Pacer Plus? i.e. ignore the Forum, choose to stay out of it and concentrate instead on the MSG? This is a very plausible scenario. What has Fiji to gain? The fact is the Forum needs Fiji more than Fiji needs the Forum. Forum leaders should realise that their hard line stance against Fiji – at the behest of their paymasters in Canberra & Wellington – is not working and all that it has achieved is split the Forum irreparably.